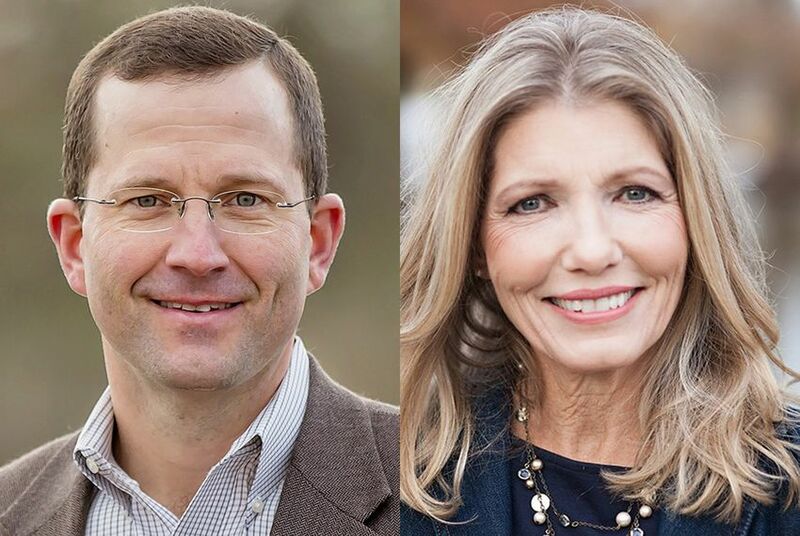 Two Republicans, former Grimes County Judge Ben Leman and Bellville businesswoman Jill Wolfskill — plus one Democrat, Cecil Webster — are on the ballot Saturday to finish the term of ex-state Rep. Leighton Schubert, R-Caldwell, who resigned in February. Ben Leman and Jill Wolfskill. The winner of the special election will complete the rest of Schubert's term, which ends in January, while the victor in November will serve the full two-year term that comes next. That has upped the stakes for the special election, in which a victory could be a boon to a candidate's fortunes in the contest 17 days later. Yet little is assured in the low-turnout, unpredictable environment of a special election, and Leman and Wolfskill — who finished just 525 votes apart in the five-way March primary — are leaving nothing to chance as they seek to distinguish themselves in the home stretch. District Republicans have taken notice of the contentious culmination before the special election. Leman is campaigning on experience, touting his record as an oil and gas businessman, a leader of the opposition to high-speed rail and, most recently, Grimes County judge. It was in that position, he says, that he cracked down on illegal immigration and cut property taxes, earning his stripes on two of the most important issues to GOP primary voters. "It’s a results versus rhetoric race," Leman said in an interview, "and people like to see results." Wolfskill, meanwhile, is positioning herself to the right of Leman, pressing a well-worn contrast in Texas GOP primaries. "I think that it’s become very clear that ... between the two of us, he is the Austin insider establishment candidate and I am truly your grassroots candidate that is the principled conservative in this race," Wolfskill said. She has been endorsed by all 12 members of the House Freedom Caucus, which was formed last session and quickly became known for its battles against leadership to pull the chamber further to the right. That the whole caucus is behind Wolfskill sends a "powerful signal" about what kind of member she would be, said Brendan Steinhauser, an Austin-based GOP strategist who recently held an event for Wolfskill in his native Fayette County. Perhaps more than in most state House primaries, endorsements — and the accompanying financial support — has taken center stage in the Leman-Wolfskill fight. Leman has received substantial assistance from the Associated Republicans of Texas, a group founded in the 1970s to turn the Legislature red that has since built a record defending leadership-aligned lawmakers against primary challenges. Wolfskill has assailed ART as a "liberal Austin group" at odds with Gov. Greg Abbott, who was on the opposite side of ART in three closely watched primaries in March. At a recent debate, Leman played down ART's role in his campaign — noting that he is his own biggest contributor, having loaned his campaign $100,000. Wolfskill, for her part, has benefited greatly from spending by Texas Right to Life, an anti-abortion group with which she has been involved since long before she ran for office. Leman has noted that in February Texas Catholic bishops were directed to cut ties with Right to Life over its tactics — and that he has been endorsed by the two anti-abortion organizations that are "in good standing with all Christian churches." Wolfskill said Thursday she is anything but ashamed of her affiliation with Texas Right to Life, saying the group knows she will be "fearless when it comes to defending the defenseless and they know that and ... I’m proud to represent that every chance I get." Wolfskill has also been endorsed by Empower Texans, a close ally of Right to Life — but her relationship with the group has seen some tension. After Empower Texans sent letters to public school employees in February seeking to root out the misuse of district resources for politics, Wolfskill wrote her own letter to HD-13 school districts, saying she had looked into it and the "accusations in letters sent to our school districts are unsubstantiated." The endorsement drama has continued up through the final week before the special election. The Texas Home School Coalition yanked its support for Leman on Wednesday, indicating it had been put off by his criticism of Texas Right to Life and Empower Texans — two organizations usually allied with the coalition. Then, on Thursday, the coalition flipped its support to Wolfskill. Both candidates have homeschooled their children. To be sure, endorsements are not the only category of contention between Leman and Wolfskill. In one of her biggest knocks, Wolfskill has accused Leman of flip-flopping on toll roads after campaigning against them while running for county judge four years ago, citing multiple resolutions he signed onto once in office and faced with a proposed toll road through the county. But Leman said at a recent debate the resolutions that county officials passed "very clearly said our preference is a non-toll road, but if all we can get is a toll road, then please give us more feeders." The feeders, he has said, would have spurred local business. Last year, the Texas Transportation Commission voted against tolling the project in question, the Highway 249 extension in Grimes County. "Toward the end of an election, especially when people don’t see things going their way, people start getting desperate and grasping at straws," Leman said in an interview. Wolfskill, he added, is "trying to create issues that aren't there." Leman has played offense too, looking to burnish his credentials as an opponent of the Dallas-to-Houston bullet train whose routes cuts through Grimes County. Leman, the chair of a group called Texans Against High-Speed Rail, has questioned whether Wolfskill makes any money off Toshiba, the Japanese company behind such railways, through her business, James Industries, a manufacturers' representative serving the power industry. Wolfskill has said Toshiba is just one of many manufacturers her company represents, and it sells equipment that goes into power plants, not high-speed rail projects. Saturday could bring an at least temporary close to the animosity. There is the possibility that the special election could go to a runoff because there are three candidates: Leman, Wolfskill and Webster, the Democrat, who has accumulated name ID in the district through his past two unsuccessful runs for the seat. A special election runoff would likely be held late in the summer, long after the May 22 runoff for the full term. "Special elections are obviously very unique," Leman said. "I certainly don’t feel like if we win Saturday, it’s over."